Order a scoop of salted caramel, blackberry lavender or pistachio ice cream. Or, opt for some waffles at this nostalgia-inducing shop. A scoop of ice cream from XO Ice Cream & Waffles. Photograph by Alana Willerton. A new ice cream shop in Auburn Bay is bringing all the nostalgia. 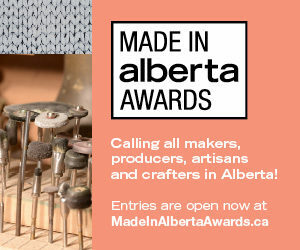 XO Ice Cream & Waffles is owned by husband-and-wife team Darren and Melanie Sortland, who previously opened and ran their own bars and cafes in France before moving back to Calgary several years ago. Around two years ago, they decided to pursue the idea of opening an ice cream shop inspired by vintage mom-and-pop shops. The goal? To create a community-focused shop for families and members of suburban communities like Auburn Bay and Mahogany (and provide delicious ice cream and waffles, of course). 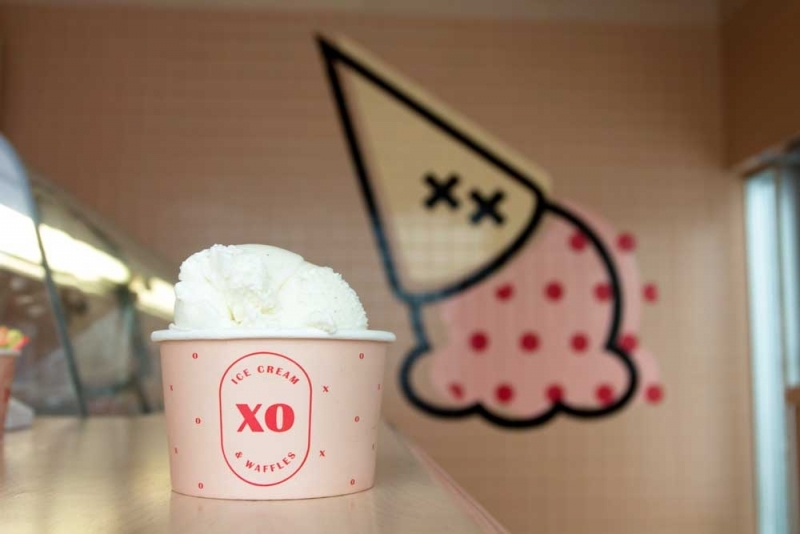 XO makes their ice cream in-house in small batches. Scoopers dressed in white shirts and bow ties serve up flavours such as vanilla bean, chocolate, strawberry rhubarb, salted caramel, coconut, pistachio, mint chocolate chip, blackberry lavender and mango sorbet. Darren says the plan is to eventually offer 10 staple flavours, plus two rotating ones. While you can order ice cream scoops in a cup or handmade waffle cone, you can also grab a cute square pint of ice cream from the shop’s fridge. The takeaway pints are $10 each or three for $25 in a gift box. All the shop’s ice cream flavours are available in takeaway pints. The shop’s other specialty is made-to-order buttermilk waffles, which are cut into wedges. They come in three flavours: classic buttermilk, chocolate and churro, which are the classic buttermilk waffles topped with cinnamon and sugar. 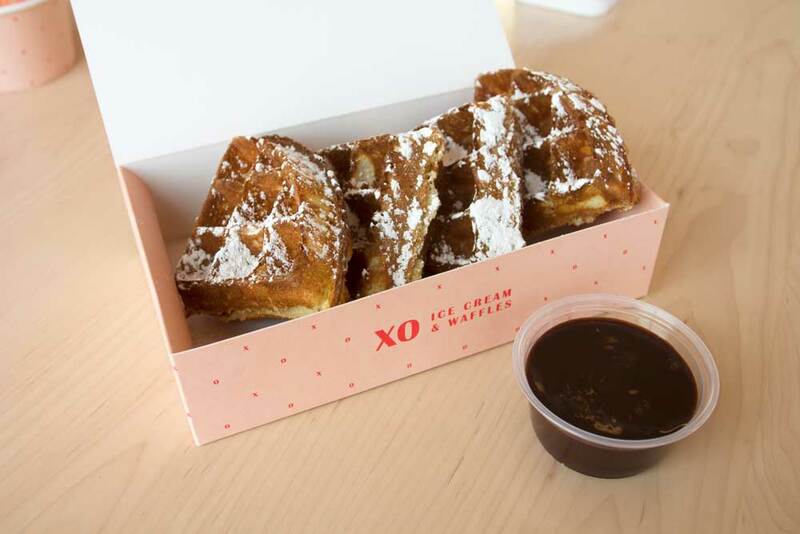 Each waffle order also comes with a dipping sauce. While the ice cream and waffles are the main reason for a visit, XO’s nostalgia-inducing design is also part of its appeal. Designed by McKinley Burkart, the shop’s pale pink tiles give the space a vintage feel, while funky dark pink lights add a modern touch. A hand painted mural of an ice cream cone on the wall anchors the space, nodding to the style of vintage comic books where the colours would bleed outside of the lines. 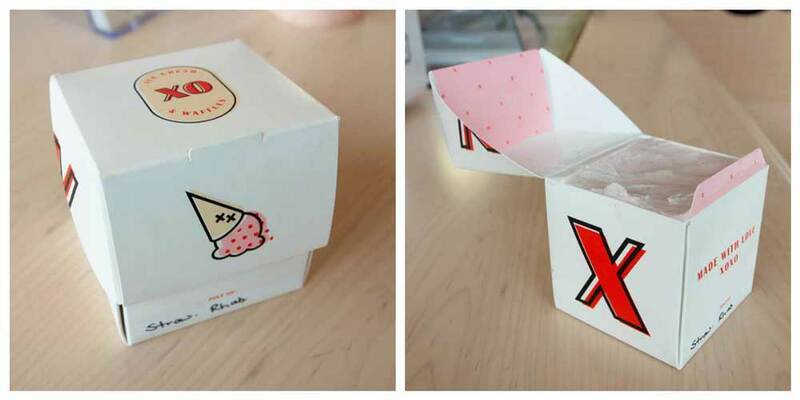 XO Ice Cream & Waffles was designed by McKinley Burkart. 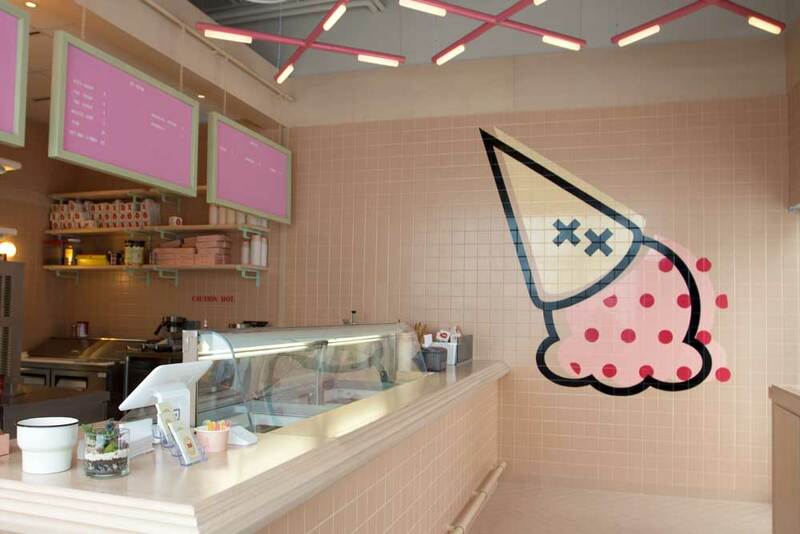 Pale pink tiles, angular dark pink lights and a fun ice cream cone mural create the perfect blend of vintage and modern. The waffles come in three flavours: classic, chocolate and churro. There’s a fridge full of takeaway pints, which are $10 each or three for $25 in a gift box. 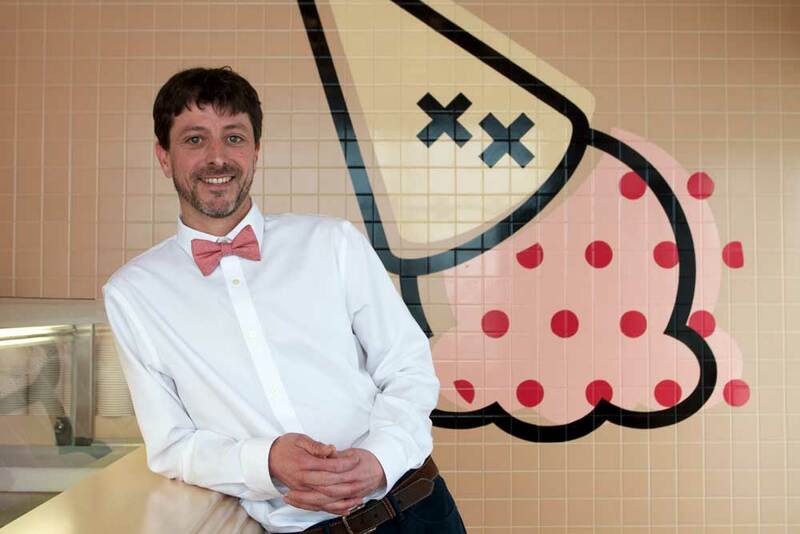 Co-owner Darren Sortland inside of XO Ice Cream & Waffles.